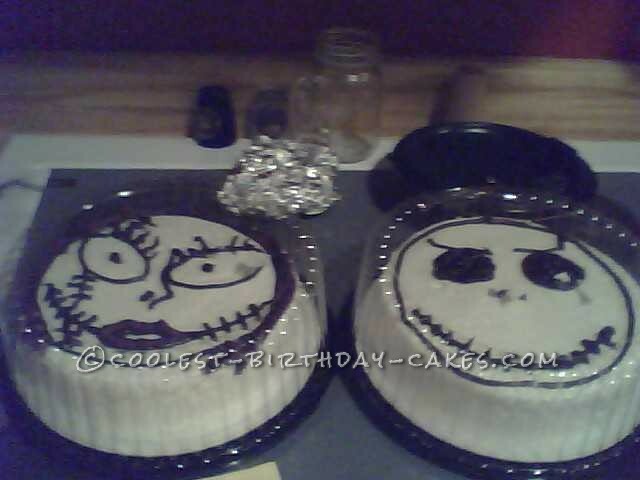 I started these Jack and Sally cakes early in the day, I just made two round cakes, it took about an hour. I then got out two cans of white icing, then a few special tipped icing packets to create the hair, eyes, mouths, noses, eye lashes, and scars. My then boyfriend, Tyler, created the Sally cake with purple icing and it took him about ten minutes, I did the Jack cake and it took me about 5 minutes. I was not as skilled with baking and icing as he was so I let him take over the Sally cake. It would have been better but I was not that worried abot the way it looked, I really just wanted to eat all of the icing. Birthday cake idea Posted by Ashley G.